Read over all forms and instructions carefully. Failure to submit the proper information will result in an automatic denial of your transfer credit. 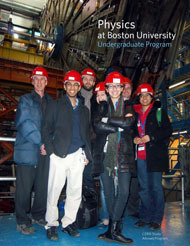 Submit the transfer credit application to the Boston University Physics Department, 590 Commonwealth Ave. Room 255 Boston, MA 02215. Be sure the form is completely filled out and that all syllabus material is attached. Applications are reviewed by the Physics Undergraduate Coordinator, and decisions are made by the Director of Undergraduate Studies. It can take up to ONE MONTH to process your application. Therefore, please submit your application in a timely manner. You will be informed by email once your application has been processed. The Physics Department will not print or gather any supporting material for your transfer credit application. Syllabi must be attached to the transfer application, mailed to the Physics Office, faxed, or dropped off in person by the applicant. Apply for transfer credit BEFORE you take the course. Do not assume that the course will be approved, and that you can fill out the application later. Do not assume your application will be approved because someone else’s was! Transfer credit equivalence is only granted for external physics courses with labs. If the external course has a lab that you must sign up for separately, list the course and lab together on your application. If you are taking a class at a college close to BU, there is a different form. There are rules about where you can take courses for transfer credit. Please refer to the CAS Student Records Office 725 Commonwealth Ave. Rm. B-3 for the list of institutions not allowed for credit. If you are found to have missing information on your application, you have ONE MONTH from the date it was turned in to provide this information. After one month, your application will be denied, and you will have to submit a new application if you still wish to apply for the same course(s).